Neighbours moved in a solemn single file into the home of John Quindos Karanja on Monday. The tragic news had changed the mood of the day. The initial plan was to slaughter three goats to celebrate the return of his wife, Ann Wangui Quindos Karanja, who would be bringing home her grandchildren. Many relatives had never met the youngest, who was born in Canada. 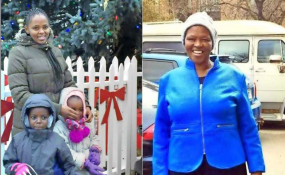 For almost a year, Ms Karanja had been living in Canada, where she had gone to help her daughter, Caroline Karanja, who had just given birth and had two other young children to take care of. And so, Sunday, March 10, would be the day Ms Karanja, their daughter Caroline and her children — Ryan Njoroge, 7, Kelly Paul, 5, and Ruby Paul, 9 months — would be returning home to Kwa Amos village, Kabatini, in Bahati, Nakuru County, where a feast was awaiting. But that was not to be. The five perished in the Ethiopian Airlines ET302 crash on Sunday at Bishoftu, formerly known as Debre-Zeit. The plane, which was destined for Nairobi, went down just six minutes after taking off at Bole International Airport in Addis Ababa. The news hit members of the ward like a bullet. And even as they passed messages of condolences to him, many could not fathom the loss that had befallen the family. Mr Quindos had travelled to Nairobi on Sunday, to wait for his family to land so that they could travel to Nakuru together for the surprise celebration. “They had been sending me pictures and updating me on their travel plans and so when the day came, I was very eager to see them and embrace my grandchildren,” Mr Quindos said, with a fortitude that belied his pain. The plane was to land at Jomo Kenyatta International Airport at 10.45am, but by noon, the flight had not arrived. When news of the crash broke, Mr Quindos was clinging on to a faint hope that his wife, daughter and grandchildren were not in the same plane, that they would somehow be alive — either airborne in another flight or just somewhere. “I cannot comprehend how shocked I am. I feel so much pain. I am at a great loss,” Mr Quindos told the Nation. The distraught businessman — who retired from teaching at St Anthony Secondary School in Engoshura and was a 2013 Bahati constituency parliamentary seat contestant — kept showing journalists pictures of his daughter and children. He has tens of them sent to him via WhatsApp and they are now kept as memories. Meanwhile, another family in Nakuru is also mourning the death of their kin. When his brother Richard Rogony died in a Kenya Airways flight KQ431 that plunged into the sea off the coast of Cote d’Ivoire, Cosmas Kipngetich Rogony was only 12, but he vowed to work hard and follow his brother’s footsteps. Now, 19 years later and as he strived to be like his brother, Cosmas died the same way — in a plane crash, leaving behind a newly wedded wife and a months-old daughter. Cosmas was among the 157 people who died in the Ethiopian plane crash. He had left for Ethiopia on Thursday, February 28, to install medical equipment on behalf of his employer, General Electric (GE). “He called me on Saturday and said he was scheduled to go to Tanzania on Sunday for some work. He said he missed me and our daughter and that he would be coming home thereafter,” his widow Miriam Wanja Rogony said. When the Nation visited their home in Naka Estate, friends and relatives were commiserating with Ms Rogony, who said she had just moved into the house on Sunday morning and that her husband had promised to come early to fix the television antennae. That was not to be.